Shraddha and Lincoln are scientists who live at Queen & Woodbine and ride along the waterfront using the lovely Martin Goodman Trail to get to work on College Street. Shraddha says, "It's a scenic commute and a solid workout rolled into one, and I feel more energized than when I endure traffic gridlock by car." It takes about 40 minutes for them to cycle to work, while driving would take an hour. 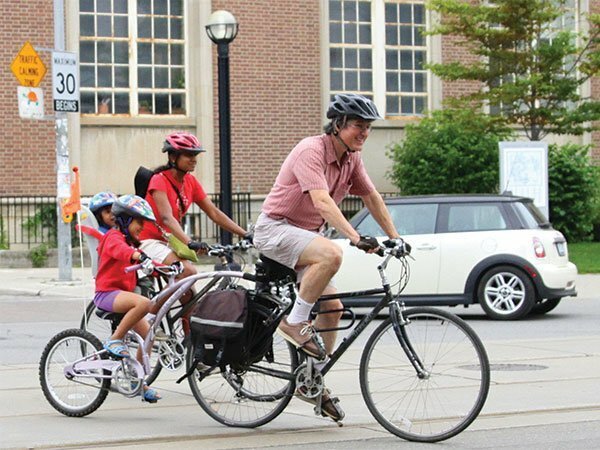 They ride with their children Gayatri and Ira in the evenings and every weekend, whether to run errands around the Beaches, or head to destinations like the Evergreen Brickworks.